How can I know the class of my sd card? [deleted post]Even they, say they don't give the official Jelly Bean, I don't want blame them. Blaming will not solve problem. I am waiting the official Jelly Bean at my country in order to I can tell other users when the official Jelly Bean come to my country. I had ever used Sony Ericsson Z310i for 27 months since 2007 and it malfunction totally after that, I was angry at that time because I took carey phone. In fact, on May 2011 I bought Sony Ericsson Xperia mini (bought Sony products again), I was satisfied. Now I try the Galaxy Ace 2, this better than Xperia mini even still in Gingerbread. [deleted post]I think I have realized Samsung is slow giving official Jelly Bean, but it's OK for me. Anonymous, 26 Apr 2013Any update about that stupid update (JB4.1.2) hahHha. Its taking toooooo loooonnnngggg!! :-) ;... moreI had checked www.sammobile.com, still no Jelly Bean for Germany, Italy, Singapore, Vietnam, Philipines, Inonesia. samsung just care about how to make a new product !!!!!! the don't care about their customers' complainment,they don't care about their old product. AnonD-19306, 25 Apr 2013thanks,bro i thnk it would be much betTer if i buy a new oNe.. there are clasSes of sD cards r... moreAcer i think that a class 6 will be ok! I have a 8 gb class 6! What the hell, samsung delayed the update to May 22!!!! Anonymous, 26 Apr 2013Any update about that stupid update (JB4.1.2) hahHha. Its taking toooooo loooonnnngggg!! :-) ;... moredude the update is postpone to may 22.. source samsung ukraine.. i think its marketing again to buy their product.. forget the update dude.. it will never happen.. samsung is a lier..
AnonD-19306, 25 Apr 2013thanks,bro i thnk it would be much betTer if i buy a new oNe.. there are clasSes of sD cards r... moreThey said, higher class was better. In my place microSD class 10 is expensive. Anonymous, 25 Apr 2013Well friend u should back-up everything that u have on your sdcard and give him good format on... morethanks,bro i thnk it would be much betTer if i buy a new oNe.. there are clasSes of sD cards riGht? clas 6,4,10 i doNt knOw what to choOse. any idEa? it seems that this year samsung is late with everything!!! and they ar the first among the world's mobile!!! Yes, still no Jelly Bean upgrade. The Galaxy Ace 2 is good, but for many games. It has 1,1 GB internal memory and 1,2 GB internal SD card. You can't put many games, except your device gets rooted and swap internal memory to SD card. 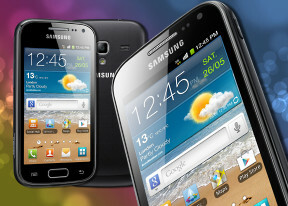 The best choice if we still like Samsung, choose Galaxy S III or Galaxy S IV. Anonymous, 25 Apr 2013Well friend u should back-up everything that u have on your sdcard and give him good format on... moreAcer the simple way is to take a sdcard from a friend and see if u encouter the same problemx if not then obvious your sdcard is the prolem.